While my primary objective in writing this story is to relay an experience with the paranormal, I also wish to provide a slither of information regarding adversities encountered by rural students during early to late 1970s in order to attend a traditional High (Grammar) School education. Hence, sometimes the background to a story is more meaningful than the story itself. This is my exact sentiment regarding this story. Leton, Brenda, Everald, Clive, Audrey, Daphne, Laxton, Audrey F, Clifton, Leighton and Sideone I write this for us. For readers to fully appreciate my experience that Thursday night, I find it necessary to first outline the circumstances (High School) which lead to me being in Hog Land Street after dark (between 9:30-10:00 PM every week day night) and secondly, the recent history behind this famed locale. It was pre-1980 Jamaica, before the rural electrification programs of the late 1970s, before the restructuring of the island banana industry in the early 1980s, before the decline of the citrus orchards in the Cave River Valley and most relevant to this story, an era when rural transportation was very poor. 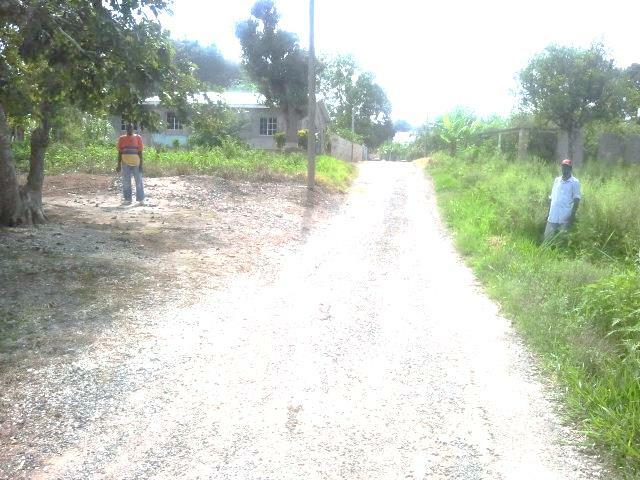 The Verma-hollis Savanna on which my village – Aenon Town is located, was considered one of the most fruitful districts in North-Eastern Clarendon or South–Western St. Anne. Fruitful was a euphemism for very rural, highly cultivated and thickly bushed and pitch black after twilight. I lived in a sub-section, off Aenon Town’s main thorough fair, called Hogland. Adequately named by my distant relatives (freed slaves) who brought the tract many! many!! years ago, after selling a pig. The banana trees on either side of the parochial motorable leading to Hogland were enormous. From the ground where they were rooted to the top of their heart leaves they towered almost 20 feet. As the leaves on both sides matured and curved downwards, in many places they formed a semi-canopy 12 – 15 feet above the 10 feet wide road. This semi-canopy covered the street for roughly 200 meters before it broke. The canopy broke for approximately 150 meters between the Sutherland’s shack and Clarence Richards’ cottage. My mothers’ house was roughly mid-way between the Sutherland’s shack and the Richards’ cottage. Between my mothers’ house and the Sutherlands’ was what had become a legendary ‘duppy yard’. Beyond Mr. Richards was no man’s land – bush, open meadow and lands previously a part of the Penrhyn sugar plantation and cattle estate. 20 meters from the Sutherland’s towards my mothers’ house was the Reverend Bridges’ house. 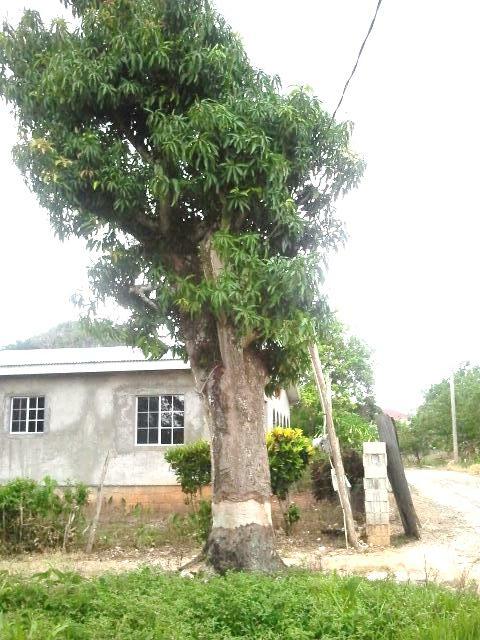 At the corner of the Bridges lot there was a large mango tree and a footpath running perpendicular to Hoglands’ Street. It leads to the houses of the Earthnuts and the Flamingoes. Roughly 10 meters beyond the Reverend’s house 50 meters from my mothers’ house in a natural depression was the sub-divisions’ public standing pipe where all the families collected water. No house in Hogland had indoor plumbing or its own water supply. Drums were either filled via guttering when it rained or through 5 gallon buckets filled at this community pipe and carried home. I can remember our house having two 80 gallon drums which I would fill up on Sunday mornings. Depending upon the amount of water remaining in them, I would have to carry anywhere between 16 and 32 buckets. Most members of the community skilled at balancing and carrying these buckets on their head but I could never do it. I swung my bucket from one hand to another every trip. I was a long way from Small Heath now! A few months ago all I had to worry about were skinheads, Hells Angels, stealing apples and breaking into the ice cream van that was parked on Hugh Road. That was a walk in the park. This was the wild frontier, Hogland was famous for four things; gambling, vulgarity, family feuds and hauntings. My mothers’ house was built in the middle of the family grave yard. ‘Always wanting to be by my people’, she considered the site most appropriate. I was 15 years old and relatively new to the community. My living situation was further compounded by the fact that there had been at least three horrible Ghost (duppy) assaults within the past four years. There was the destruction of the Richards family, a deadly phantom bull incident and the bombardment of the house next door to mom’s (‘the duppy yard’). Exactly what precipitated the attack on the Richards’ is unclear. I was not a witness to the event but I heard the family’s lamenting just before daybreak that Sunday morning. Based upon the eye witness accounts of a handful of men gambling in the street that night it was as a Tornado. In a blitz attack, a duppy swept through the common-law couple’s two room cottage, creating havoc. Furniture demolished, windows and china broken. When the dust finally settled, two of the children had died and their father, a well-known coach driver, would never fully recover. Mud Root as he was popularly known, had been slapped by the duppy in the face so hard, his neck and his left cheek remained irrecoverably distorted for the next 10 years of his life. The phantom bull incident occurred a few years prior to that of the Richards family. A mother (Ms. Flamingo) and her 11 year old daughter (both residents of Hog Land) coming from shopping at the local fresh market were attacked in broad daylight by a phantom bull. In an attempt to escape the furious ‘Bull’, the child tore from her mothers’ grip, jumping into a nearby creek. It was during the regions rainy season. Seasonal streams, brooks and rivers were at their peak. Despite the mothers numerous attempts, her innocent child never resurfaced until two days later. Was it an enigma? There was no bovine on the meadow that day! Despite the destruction and death, neither the phantom bull nor the Richards family incident (both stories which, I will put to pen in detail at a more opportune time) made the newspapers or the local news. As I mentioned before it was a pre-dawn blitz attack, carried out with military precision. The demon was there one minute and gone the other. 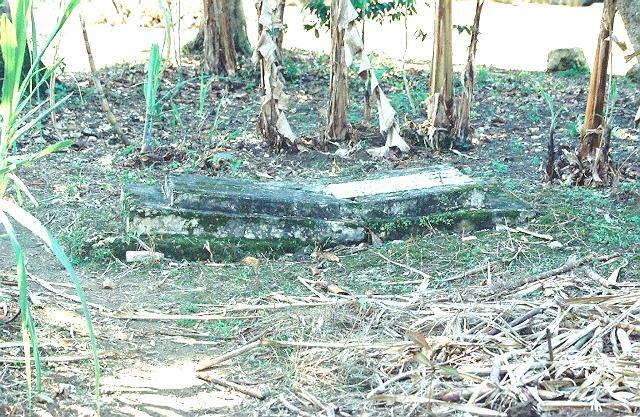 Possibly the most spectacular duppy attack in Central Jamaica (the parishes of Clarendon, St. Anne, Manchester and Trelawny) was about 18 months before – the early 1973 bombardment of the Gold Tooth’s’ house. 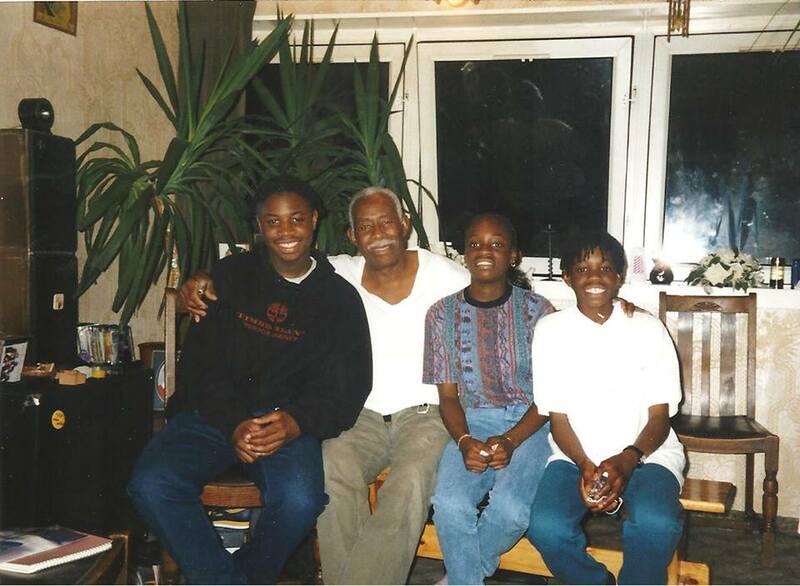 Our family had just moved back to Jamaica from Birmingham (England). Our house was in the process of being built on land that had been in the family since the emancipation in Jamaica. The Tooth’s were our neighbors before my parents migrated to England in the late 1950’s. I didn’t witness the event, as we were staying with family friends in Kingston. Based upon eye witness accounts, it was a five day event. Almost a Biblical as the plagues of Egypt – the ghosts began with hot boulders, then followed with ants and flies. My Readers!!! Hogland Street made the national News. It was as a once in a lifetime event, thousands of curious spectators came from miles by the bus and truck loads to witness the unbelievable. I will save you readers the gory details for another time. I should get back to my original story. You are probably wondering what circumstances had a 15 year old out so late in the boon docks on a school night? High School!! High school was almost a luxury; and as with all luxury items, it came at a high price. Giving children an opportunity to acquire a high (grammar) school education came at a high price to the parents. Attesting to how fortunate one was to be selected for high school was the fact that spread out over 7 miles in my village only 12 (Leton, Brenda, Everald, Clive, Audrey I, Daphne, Laxton, Audrey F, Clifton, Leighton, Sideone and Myself ) of probably 180 kids of high school age attended. A child going to high school siphoned a larger percentage of the family’s funds. Other siblings often felt cheated having to do more of the house chores and at the same time sacrificing their share of whatever the family finances was supposed to buy. High School students may have been fortunate but they paid an equally high price. The transportation system was very poor. Traditional high schools were few and normally distances away from homes. Transportation generally limited; one bus out early in the morning and one bus back home late at night, high school students only saw their home, parent and rest of the family by the light of day on weekends. Both child and the rest of the family paid dearly. Over the course of 3 – 5 years High School students became strangers in their own homes. Siblings gradually grow indifferent to each other, even enemies. As immediate families became estranged, those with whom they regularly rode the bus became surrogates. So it was between Sidone and me. Sideone was an Ennis and my senior. She also lived on Hogland Street. Negroid and Indian mix (what is referred to in Jamaica as Coolie Royale), she possessed a rare beauty and an air of confidence which came from her not being oblivious to her assets. I was often dumbstruck when we walked the 200 plus meters of street common to us, at night. This was especially true for students living in Dry Harbor Mountain villages, for only one bus (Metro) went through Frankfield, where the nearest High School was located. Beginning in a higher mountain village (Troy) at a ridiculous hour every morning, Metro skirted the hills passing through Aenon Town where I got on at 6:00 AM. Passing Aenon Town the bus navigated the cockpits’ isolated hills and valleys to the lowland petit metropolis of Frankfield. Frankfield was the first point on the busses route where public transportation became readily available. Leaving Frankfield Metro would continue letting off passengers until it got to the fishing town of Rock River. Students were picked up at roughly 7:00 PM. This however was the drivers return journey, fatigued he would drive slower, there were more frequent stops and more time spent socializing. Metro never got to AT before nine o’clock in the evenings. Hence, students that travelled the Troy Metro were not only accustomed to arriving at school late, but also getting home late and walking the last 5–30 minutes home in total darkness. Shared experiences such as being bitten by the fangs of hunger, raiding citrus orchards, the disappointment of a bus not turning up in the evening countless times and the pains of having to walk home bonded us. I would do my past travelling companions (drivers, conductors, higglers and regular) great injustice if I didn’t say it was very much a family affair for us. Dry Harbor Mountain community members, operators’ of the Troy to Rock River Metro all had as much invested in our high school education as immediate family members. If for some reason a student was not at the bus stop on a school day, knowing Metro was the only bus out, the bus was parked, and the driver blew the air horn making a horrendous noise disturbing all who still slept at that hour. Simultaneously, regular travelers enquired regarding his welfare. Why no school today? Many times I overslept. Awakened by the horn I would throw my bag over my shoulder, holding my shirt, shoes and socks in my hand run get dressed on the bus, so as not to delay other passengers too badly. At night if students were hungry they were fed by higglers either going or coming from market. It was sometime during the 1975 – 1976 academic year. As usual the Troy to Rock River Metro dropped the Aenon Town kids off Late. Late was relative. It was probably a few minutes after ten o’clock. In rural 1970s Jamaica, all except die hard gamblers and those of dubious reputations would be in bed. It was a full moon. I can remember vividly, walking through the Street one could not help appreciating the tranquility, how the marled (crushed Limestone) street glowed or the silvery hues covering the vegetation as the different leaves reflected the light of the moon. Absolutely beautiful!!! We were totally relaxed and I was somewhat happy with myself that night. After two years of doubt, low self esteem and pride I had managed to strike up a semi-intimate conversation with Siddone’. Roughly 20 meters from the South’s was a large mango tree, here every mans’ heart throb turned right unto a foot- path that lead only to two houses – hers ( the Earthnuts’ and their neighbor the Flamingoes’. She would be home before I got to the community stand-pipe. As I took a few steps beyond the mango tree I noticed a male looking figure bent over the faucet. He was of average height and built, dressed in light colored clothing. It seemed as if he was drinking water. I advanced counting the possibilities as to who it was. My curiosity was largely born from being happy to see someone else in a normally lonely section of my journey. At about 5 meters the person assumed an upright gait faced me directly. I had a good hold on the physique and facial features of an individual in the community but this face was indistinguishable. Figuring it was a stranger, I still considered it a pleasant surprise. His next move left my heart pounding and my every muscle paralyzed. In a single step, my figure of average height moved from the stand-pipe fixed on the embankment to my left over the width of Hogland Street into the fields on my right. It only took a millisecond for the adrenaline to kick in but then it seemed forever. I ran the final 40 yards to my house in hysterics crying Haa!! Haaa!!! Haaaa!!!! And yelling for my mother – MOMMAH! MOMMAAH!! MOMMAAAH!!! The aforementioned already had me running very fast. Senses heightened about half way into my 40 yard run, I heard Sideone scream and then something rustling through the bushes. She was roughly 30 yards to my right and directly in what I projected to be the ghost’s path. Chivalry was out the window. It was everyman for himself. Involuntarily my body gathered an extra burst of adrenaline, my feet went into overdrive and don’t think the road runner could have caught me. Bonded through adversity, intimacy out of the question, Siddone and I continued to accompany each other through Hogland Street for another two years. We never spoke of that night until the summer of 1994. How we laughed!! She hadn’t seen a thing, she screamed because of my hysterics. The rattle through the bushes was her book being hurled so as not to hinder her quick retreat from whatever had scared me. The bag coming in my direction was a fluke. That was the last time we spoke. She was called for higher services a few months later. May she rest in peace. I did not discover the identity of my ghost or the location of his grave until roughly 32 years later in 2008 after relaying my experience to the 92 year old matriarch of the Flamingo family (Mother Glover). Mockingly she laughed and said “I remember hearing you that night!! Also Ms. Earthnut (Sidones’ mother) and I talked about it the morning after!! It was nobody but that Mass Eleck. He had always been a wicked and barefaced old man. He is buried in the Lesley family plot over there”. For the purposes of this story I placed two of my friends in the relative positions of what I considered to be Mass Elecks’ step on the night of our encounter. The first (white shirt) marks the position of the old stand pipe. The other (red, black and yellow shirt) marks the limit of his stride. That stride was approximately 21 feet in length give or take a foot. 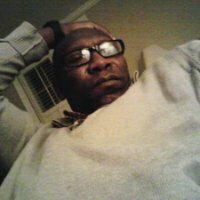 This entry was posted on May 15, 2015 at 6:03 pm and is filed under Articles, Arts, Black British Literature, Black History, Books, Community, Culture, Current Affairs, Education, Fiction, Literature, Music, News, Newsletter, Poem, Poems, Publications, Reggae, Short Story, Television, Theatre, Writing with tags Articles, Arts, Black British Literature, Black History, Books, Community, Culture, Current Affairs, Education, Fiction, Literature, Music, News, Newsletter, Poem, Poems, Publications, Reggae, Short Story, Television, Theatre, Writing. You can follow any responses to this entry through the RSS 2.0 feed. You can leave a response, or trackback from your own site.